When Sara Kree Hall and its furnace tower were demolished in 2017, thousands of migrating chimney swifts lost their roosting place. Shepherd University responded to a community outcry that the birds would be displaced and promised to find a new home for the birds. “We are building a 6 foot by 6 foot by 30 foot high, freestanding, brick building,” said Katelyn Walters, land and conservation manager for the area Audubon Society. She is optimistic that the birds will return, noting that some 80 percent of previously constructed towers receive swifts in the first year. A branch of the Audubon Society in North Carolina successfully constructed a similar chimney swift roosting tower in 2015. “The state ornithologist with the WVDNR, Richard Bailey, has reviewed our plans, visited the proposed site and feels confident chimney swifts will return to use the new tower,” Walter said. In addition, PVAS will provide audio recordings of swift calls to help entice them to the new tower. 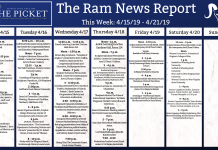 Shepherd was receptive to the project proposal, and in addition to providing land, faculty members supported advertisements and letters of recommendation for grant funding. The entire project will cost $85,000 and Walters says they are “well on our way to achieving that goal.” She declined to give exact amounts. They hope to complete funding this fall, she said. 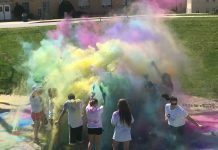 Shepherd students can hold fundraisers for the tower individually or as an organization, Walters said. “Significant donors will receive recognition on a plaque on the tower. This is a great opportunity for various SU student groups to leave a lasting legacy,” he said. PVAS is also planning to host “A Swift Night Out” once the tower is completed to observe the swifts and celebrate their return to Shepherdstown. Shepherd students will be invited. Additionally, the tower was specifically designed for chimney swift research. 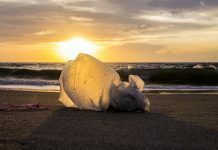 Once completed, it will provide student opportunities to “conduct research studies on this cryptic and near-threatened species, and may also be used in some classes,” Walters said. Bird watchers who gathered to watch the birds enter the Sara Cree tower in 2016 counted 1,500 birds. Now that the building is gone it is difficult to measure population as the birds are scattered in smaller sites. Chimney swifts are native to eastern North America. They are a neo-tropical migratory species who travel to North America from South America every spring for nesting. They received their name due to their adaption with human civilization in a distinctive way. The birds roost inside of old-fashioned chimneys that have large, deep structures. 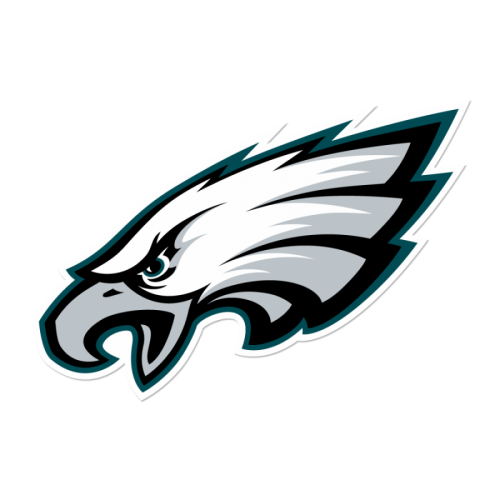 In the wild, these birds would normally roost inside of large hollowed out trees. Due to mass logging of old growth forests across the eastern United States, these specific habitats are now hard to come by. Miraculously, as human development began to grow, these birds discovered they could use chimneys to roost in instead, hence their name Chimney Swift. As civilization has advanced, there is no longer have a need for those classic brick chimneys atop historic homes. Many chimneys have either been removed completely or capped and are not in use. Most modern buildings have done without them or redesigned them to be a small and insignificant part of the building structures. 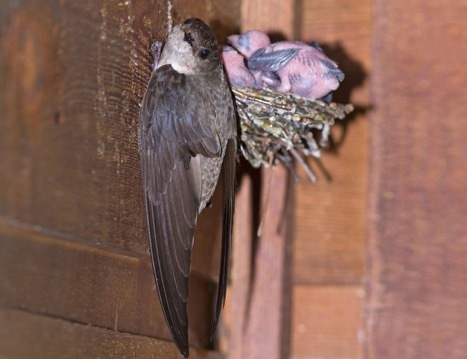 This has led to a decline in the chimney swift population, as much as 53 percent in the US and 90 percent in Canada during the past 50 years, according to the Audubon Society. The Audubon Society is an environmental nonprofit that dedicates much of its resources for preservation of birds. 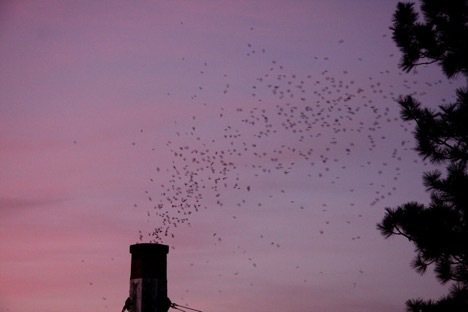 Swifts are famous for their dusk flocking habits prevalent during the month of September. Bird lovers and curious observers gather to known roosting locations to witness huge flocks chirping and swarming chimneys, where they still exist. As they begin the descend into the chimneys for the night, the birds put on a magnificent show diving flawlessly into the dark chimney. During their annual 6,000-mile migration to the Amazon Basin, swifts travel in large flocks. 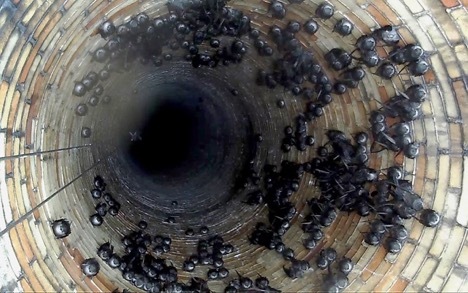 Thousands of birds can be seen roosting in a singular large chimney. Other than wildlife preservation, there are benefits for humans to maintain a healthy swift population. Swifts consume flying insects and according to Walters, “An average sized chimney swift can consume over 3,000 mosquitos in one day. They are an excellent natural pest control.” Birds play an important role in maintaining a balanced ecosystem. Swifts build their nests out of brush and hold it together on vertical surfaces using their saliva which acts as an adhesive. Parent birds feed insects they’ve caught to their young, who will exit the chimney around 20 days old by climbing to the top. Offspring begin flying around one month old. Anyone can help preserve Swifts through various measures. If your home has a brick chimney, consider removing the cap during mating season for these birds to roost in. 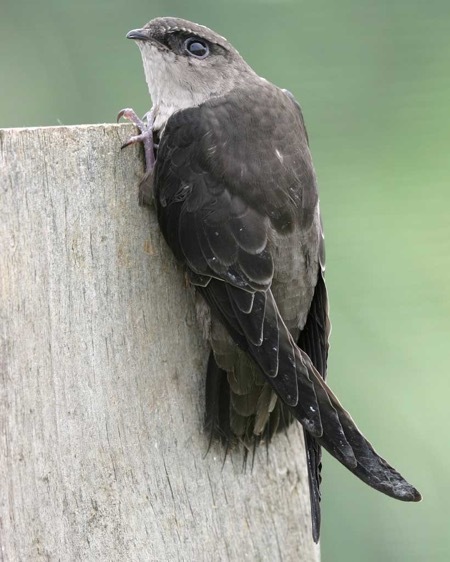 You can also support local efforts to preserve Chimney Swift habitats.